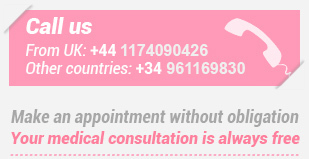 Make an appointment without obligation with Eva Clinics. Take the first step on the path towards your baby. Our staff is made up of the best reproduction medicine professionals who are waiting to help you achieving your dream. Come to visit us. We will inform you without obligation and waiting lists. "They have passion for their work and make you feel like your dream is their dream too"
They were just setting up the clinic in Madrid, Calle Velazquez. As soon as I walked into the clinic, I was surrounded by warmth, smiles, empathy, genuine interest and kindness. "Finally we are the family that we always dreamed of; Our Diego junior is here!" "Life is full of love for my child Diego"
Take the first step on the path towards your baby.